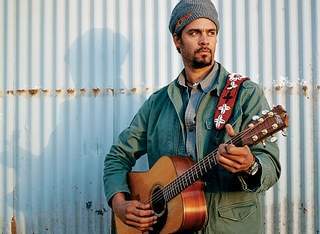 Making music under the Jamaican sun last year was a rejuvenating experience for Michael Franti. While recording his latest album, All Rebel Rockers, the category-defying singer-rapper collaborated with Sly & Robbie, the famed Jamaican production duo whose approach was refreshingly laidback. "I would come in with my acoustic guitar. Sly would play a drum part on his thigh, and Robbie would hum a bass line," says Franti, who headlines Rams Head Live on Saturday. "But it's different, recording in Jamaica. The doors of the studio are wide open, so people would wander in during the recording, smoking a spliff, and somebody would say, 'Hey, you need a keyboard part.' And they were right. Music is such a part of life there." The sun, the music-loving strangers and the free-flowing vibe in the studio partly inspired the joyous feel of All Rebel Rockers, the studio follow-up to 2006's Yell Fire. Though still driven by Franti's pointedly political lyrics, the recent CD is more buoyant than its predecessor, which seethed with sharp anti-war songs. Franti's working relationship with Sly & Robbie began with Yell Fire. "When I came back from a trip to Iraq [where I] talked to the soldiers there, I started writing Yell Fire. It reflected what I saw there," says Franti, who last week was calling from the road in Tennessee. "This time, there was so much pessimism during the election I wanted to make a record that was uplifting during these times." The album cover for All Rebel Rockers suggests riotous music inside. There's Franti with his fist in the air, leading a militant group on motorcycles. A fine thread of lyrical resistance is deftly woven throughout the spirited music. Cuts such as "Life in the City" detail the nasty truths of living in uncertain, violent times. But it's all underscored by celebratory reggae and dance hall rhythms that roll and sway or throb and rock. "Musically, I've always drawn from different styles," says Franti, 41. "But with this one, we wanted every song to be one you could dance to. Lyrically, I homed in on songs you can really sing along to and the words still have more meaning." The artist, who began his career in the late '80s as part of the fiery rap group the Beatnigs, focuses less on spitting rhymes and more on crooning in his soothing baritone. He even gets downright sensual on the dub-flavored slow jam "All I Want is You." Warmth suffuses the gentle acoustic ballad "Have a Little Faith." All Rebel Rockers is smartly streamlined and easily one of Franti's most accessible and ingratiating albums. But it's a sound that will probably remain outside the emotion-free, ringtone-dominated world of today's pop - not that the artist cares to enter that realm. "The focus used to be selling CDs, but sales are plummeting," he says. "Artists now are making the money on the road, which is always how the band and I made our money. We play bigger theaters than people whose records are played on the radio all the time. Now, it's a new opportunity for artists to connect to fans in a more personal way on the road and through the Internet." In November, while on tour in Baltimore, Franti and his band recorded "The Obama Song," an Internet-only single that generated buzz on the Web and helped spur strong sales of All Rebel Rockers. With the album, Franti says, he wanted to deliver something more upbeat but rooted in reality, something that captured the hopeful vibe he felt while recording in Jamaica. He says, "There's so much out right now to make us all feel bad, you know. I wanted something that would make us dance - for a little while." Michael Franti & Spearhead play at 7:30 p.m. Saturday at Rams Head Live, 20 Market Place. Tickets are $27.50-$30. Call 410-244-1131 or go to ramsheadlive.com.